Against the backdrop of the carnage in Mumbai, India, on Dec. 1 U.S. President-elect Barack Obama unveiled the National Security team charged with keeping America safe from similar atrocities. Among these critical figures is Arizona governor Janet Napolitano, whom Obama tapped to become America's third secretary of Homeland Security. Napolitano, a former attorney who has earned plaudits from both sides of the aisle for her nuanced approach to the hot-button issue of immigration, "insists on competence and accountability," Obama said in a statement. "She knows firsthand the need to have a partner in Washington that works well with state and local governments. She understands as well as anyone the danger of an unsecure border. And she will be a leader who can reform a sprawling Department while safeguarding our homeland." Napolitano  who gave Obama a key boost when she endorsed him last January in the run-up to the Arizona primary  will need to marshal all of these skills in order to successfully repair a department still smarting from criticism over its handling of domestic terror cases and its response to Hurricane Katrina.  Born in New York City; raised in Albuquerque, N.M.
"If you build a 50-foot-high wall, somebody will find a 51-foot ladder." "It wasn't about gender, nor was it about race. I chose Senator Obama because to me this election is fundamentally about change." "Arizonans look around, and their emergency rooms are packed, and their class sizes are huge, and they see a federal government that has not seemed committed to protecting the border. They don't see an immigration law that really is enforced firmly and fairly, and they act accordingly." "I'm not entirely kidding when I say you shouldn't be able to get a driver's license until you've passed algebra." "If someone likes people as much as she does and yet is able to get down to the nitty-gritty and crawl around in boxes of figures, she's an extraordinary person." 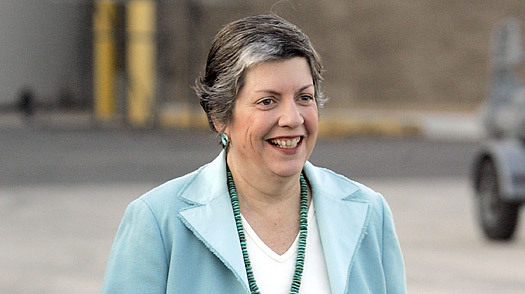 "Janet Napolitano is probably the smartest governor, if not person, in the country." "On [immigration] she has long been one of the cooler voices in the state. She says she likes to begin speeches before tough audiences with a rhetorical question: 'Who here favors illegal immigration? Nobody? OK, we've got a consensus that nobody is supposed to agree on. Let's go from here.'" "She's kind of a female Hubert Humphrey, a real happy warrior."